A decade ago, after years of stoke-on surfing and other outdoor sports — and the accompanying serious sun exposure — Kurt Shipcott’s future wasn’t looking so bright. The California native had developed a callouslike growth called a pterygium on his left eye, and it needed to be surgically removed to prevent permanent sight damage. Once the procedure was done, Shipcott still had a dilemma: How could he continue to pursue the perfect wave while heeding his doctor’s instructions to vigilantly protect his eyes from the sun? Public awareness of skin cancer was already widespread, but the same could not be said for what these same rays were capable of doing to eyes left unprotected for long hours in the surf. Shipcott’s solution? Gotta wear shades — or, at least, something similar to them — while surfing. Sounds simple enough, but it wasn’t just a matter of being the cool dude willing to surf wearing the same sunglasses he wore on land. Practical concerns like losing them while shooting the tube — or wiping out — and standard shades’ cumbersome feel while surfing prevented that. The goggles, called the Duke, for Hawaii’s Duke Kahanamoku, offer wraparound protection from sun and wind, and they float, in case of a spill in the waves. What Shipcott really wanted and needed wasn’t available. So in the “backyard” tradition of many surfboard shapers, Shipcott hunkered down in his parents’ garage and began to create prototypes for surf goggles that combined sunglasses and swim goggles. Many trials, errors and successes followed his first prototypes, and Shipcott eventually moved from garage to factory production in Hermosa Beach, Calif., and now has his own company. 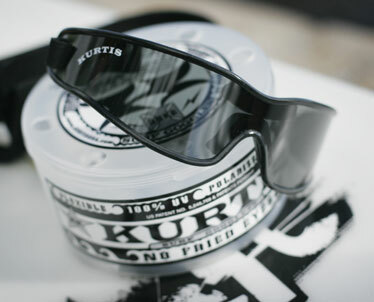 Kurtis USA produces patented surf goggles that take care of the practical concerns while also offering polarized lenses that provide 100 percent UVA/UVB protection and a shield from wind exposure, another cause of eye problems. Kurtis USA’s first model, the Duke (named for Hawaii surf icon Duke Kahanamoku), was launched in the summer as the good-for-all style. Most everyone who puts on polarized sunglasses for the first time has the same reaction. Now, try to picture having that same clarity and protection from ultraviolet rays when pulling into the barrel at your favorite surf break. Yeah, super-cool. It was a concept previously just imagined, but the recent release of patented polarized surf goggles has made it a reality. The Kurtis USA goggles called the Duke (for Hawaii’s Duke Kahanamoku) provide 100 percent UVA/UVB protection — and the cool view. Part sunglasses and part swim goggles, they provide the same protection and aesthetics as a quality pair of wraparound shades but add frame flexibility, flotation and fog resistance in a light weight that makes them practical in the surf and for other water sports like canoe paddling. A few years ago, sunglasses giant Oakley tried to market shades for water use, but they never caught on, despite being promoted by some surfing stars. Admitting he was a bit disheartened by the Oakley release — he’d been laboring with his own prototypes since the late ’90s — Shipcott said he soldiered on when he realized Oakley had not made its product floatable, flexible or even polarized. At Kewalo Basin, surfer Kaiea Bosgra tries out a pair of surf goggles made by KurtisUSA. The goggles are polarized and provide 100 percent UVA/UVB protection. The Duke sells for about $200. The one-size-fits-all style comes with a neoprene head strap and leash, lens cloth and a storage container. Shipcott says he’s continuing to improve upon the technology and materials used in the goggles, and new styles — such as the for-the-surf-divas-inspired Kaiser Bowls — are expected. Support for the goggles is growing among eye-care professionals. Orange, Calif., optometrist Gregory Char, a Hawaii-born transplant, carries the goggles in his office and surfs with them himself. Like Shipcott, Char once suffered from a pterygium, a callouslike growth on his eye caused by sun exposure. “Like the skin, the cornea can get burned, which is very uncomfortable as it stings,” Char said. Added Dr. John Hovanesian, a Southern California-based eye surgeon: “For a long time we have been trying to get surfers to wear sun protection, but nobody has designed a pair of sunglasses that they can live with. It is a great relief finally to see an option that offers the protection we want and the flexibility they want. Shipcott has been busy getting the goggles into the hands of big-name surfers, such as current world No. 1 Mick Fanning and former world champion Sunny Garcia, and building his surf team with up-and-coming amateurs who regularly sport the protection. Oahu’s Kaiea Bosgra is a team member, and one who knows firsthand what it’s like to get tubed wearing the Duke. Kurtis USA’s surf goggles are available at Wet Feet on Oahu, Hana Highway Surf Shop on Maui and Nukumoi Surf Shop on Kauai, with more outlets expected soon. Order online at www.kurtisusa.com.